I recently was invited by a national network morning talk show who asked for tips for travelers who were afraid to fly. The interview took place in an airline cabin mock-up on the set of an aircraft-themed studio with an on-air talent and a show producer. The producer’s job requires her to fly regularly and as it turned out she was actually afraid to fly herself. They had asked me for some tips for coping with the fear of flying prior to an upcoming holiday weekend. The interview lasted for about two hours and we talked extensively about the problem and ways to overcome it. The segment that aired on NBC’s The Today Show and included 3 of my most important tips. I love the opportunity to talk about how to overcome a fear of flying since when it comes to phobias, which fear of flying is one of, it is one of the most successfully treated phobias there are. In this era of soundbites, however, the risk of providing quick tips for a ratings-hungry media is that the real secrets to success get lost in the process. Education about the problem and your symptoms is the best place to start. While knowledge is power, power comes from insights that led to action. While you’re educating yourself, immediate relief from the anxiety triggered by flying can be obtained by learning how to distract your mind from the obsessive thoughts that keep your rational mind hijacked by your survival instinct. Finally, the support of other fearful flyers and empathetic family and friends literally causes chemicals to be produced in the brain that contribute to feelings of well-being that can override the anxiety. Here are some simple tips that can be of use on a short-term basis. Breathing is something so fundamental to life, for most of us it is hard to imagine that using it purposefully it is a powerful and fast way to manage one’s anxiety. It also is free, so we generally don’t see it advertised as one of the most effective method and immediate tool to combat our anxiety. However, according to science and my own feedback in over 31 years of teaching this technique, if used effectively, it is proven it can reduce symptoms of anxiety, stop panic attacks, relieve migraine pain and even help stop muscle spasms or cramps. Any time that you feel anxiety or stress levels rising would be a perfect time that you might choose to breathe through a straw. Whether it’s driving to the airport, waiting in the boarding area, or sitting in the airport, there’s nothing like focusing on your breathing to calm yourself down. Having the straw in your mouth reminds you to breathe. That almost sounds ridiculous, but when under stress, we forget about our breathing and our anxiety takes over. Breathing through a straw artificially reduces the volume of air that you inhale and exhale in any given breath. By focusing on your breathing and counting the number of breaths per minute—no more than 10-12—you can slow your body’s response to anxiety and with it, lower the anxiety itself. Next, you want to concentrate on exhaling for double the amount of time you inhale. Put simply, if you breathe in and count to four seconds, you should then slowly exhale and count to eight seconds as you do it. This triggers a change in the nervous system from ‘sympathetic’ mode – which is what we associate with fight or flight – to ‘parasympathetic’ – or ‘rest and digest’ mode. This likely sounds crazy, if not bizarre at first blush. Why would writing with your non-preferred hand have any effect on your ability to control your anxiety? Neurons that ‘fire’ together, ‘wire’ together. In order to avoid obsessive thoughts, we must create new neuron pathways. One way to simulate this is to take something we do without thinking—handwriting—and disrupt the process. In the process, you distract your mind from where it wants you to put your attention to where you want it to go. In this case, writing with your non-preferred hand. Approach the podium at the boarding gate as soon as you arrive and request that you would like to pre-board the airplane. The criteria for pre-boarding are that you need extra time or a special seat. Both criteria fit the needs of a fearful flyer. There is no shame in pre-boarding as it can prove to help lower your anxiety about flying. It also can provide you with a golden opportunity to meet the pilots as described in the next tip. From the feedback of thousands of my coaching clients and students in my classes, I can confidently say that you get to briefly speak to the pilots 9 out of 10 times.
. When you meet the pilot, simply repeat that you are a nervous flyer and add, “Any information that you might pass along about the flight would be appreciated” and let the pilots take it from there. While meeting the pilots before your flight is an important and perhaps more obvious strategy for lowering one’s anxiety, seeking out one of the pilots after a challenging flight can be even more important. Many a fearful flyer has told me how an unpleasant experience like weather and turbulence was the moment that they recalled the onset of their fear of flying. They perceived the situation as life-threatening combined with feelings of helplessness setting the stage for fear and dread from that point on. 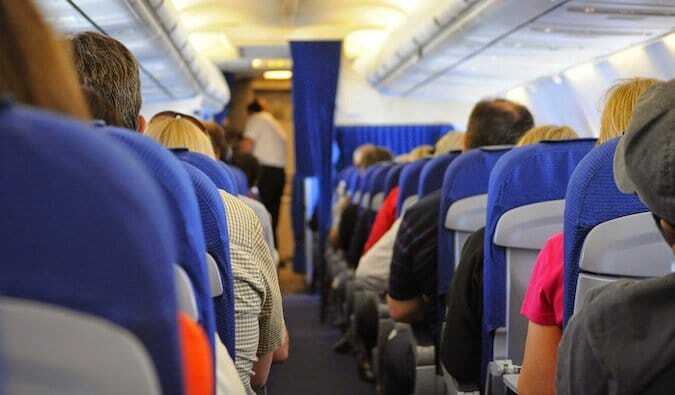 Any flight that causes anxiety such as one with turbulence can leave you unsettled at the end. Most flights end with one or both of the pilots standing near the exit saying goodbye to passengers. Few flyers think of asking the pilots if they could ask a question or questions about the flight. It gives you an opportunity to get their perspective on the flight, to perhaps learn something about the flight that you did not understand before, and to leave with a lowered state of anxiety minimizing the possibility of becoming stuck with anxiety. Educating yourself is a longer-term strategy for getting through your fear of flying. Immersive Distraction is the strategy that gets the most results the fastest. When I think distraction, I think about the dog in the animated movie Up. The mere mention of a squirrel causes his brain to completely dissociate from whatever he was thinking about. Unfortunately, our brains aren’t typically that easily distracted—particularly when it comes to being hijacked by our fight-or-flight system. Usually music and movies are not enough to help fearful flyers distract themselves enough to alleviate their anxiety. That’s why we developed the FearlessFlight® Kit. 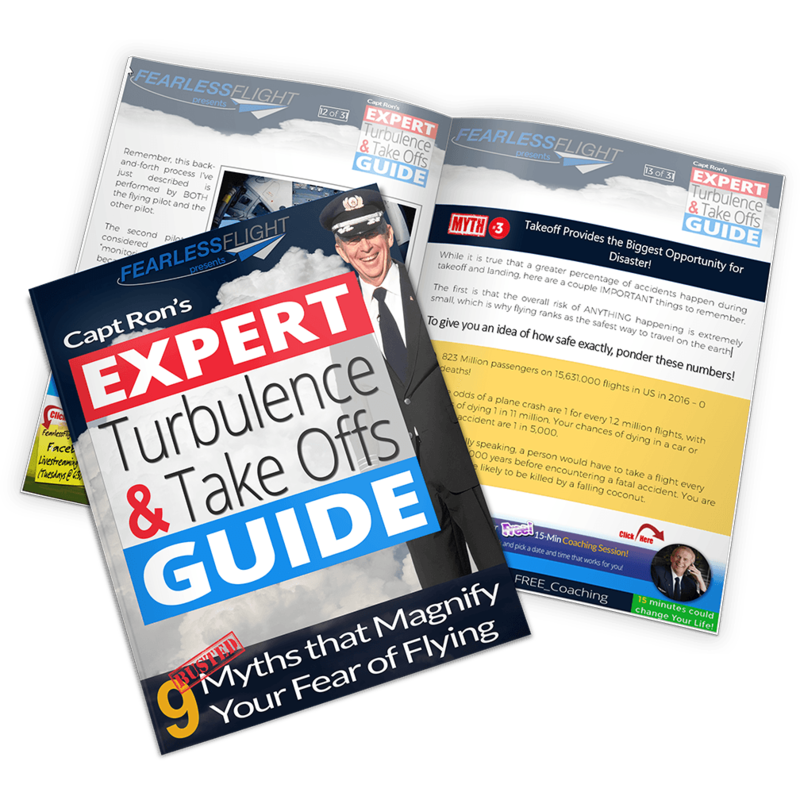 It is a comprehensive collection of 7 tools that are digital and downloadable so that you can begin working on your fear of flying immediately. However, the FearlessFlight® Kit and the FearlessFlight® Harmonizer were developed specifically to help you shift your attention when those fearful thoughts and images ‘trigger’ your survival instinct. If you made it this far in this article, then please let me reassure you that there’s no need to fly with anxiety. If you have a fear of flying, you don’t have to wait. We provide free, live classes each month at the Phoenix Sky Harbor International Airport. You can also find relief right away at www.FearlessFlight.com, listen to our weekly FearlessFlight® LIVE Show on Facebook or contact me directly through Facebook Messenger. If you want to speak with me right away, you can schedule a free 15-min online coaching session directly by clicking here. You don’t have to go it alone! Don’t let your fear spoil your spring break.